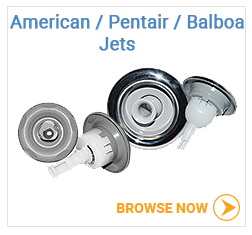 Browse our large selection of Waterway hot tub jets, CMP spa jets and American/Pentair spa jets. We carry many different brands of hot tub jets for most hot tubs on the market in Canada. 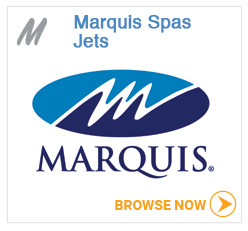 Select the brand of replacement jets for your hot tub below. How to identify which brand of jets are in your hot tub. 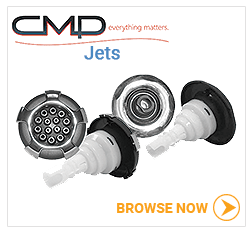 Waterway jets and CMP jets appear to be the same at a quick glance, but they are different enough in design and size that they are not interchangeable. See illustration below. Note the 2 grooves on the Waterway jet on the left highlighted by the 2 red arrows. By comparison, see the CMP jet to the right of the Waterway jet with the difference between the two highlighted by the red arrows. 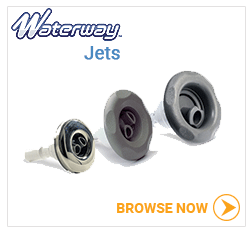 The Waterway jet is also 1.5mm larger in diameter in the back and will not fit in a CMP jet body hole.